One of my goals this year is to read more history books. I love learning about history – I even majored in it in college – and I have a kind of ridiculous collection of history books on my shelves and haven’t read a good 90% of them. So, naturally, I did not pick from that pile this month for my nonfiction read. Instead, I choose a book that seemed incredibly relevant (and interesting): Impeachment: An American History. (From Goodreads) Four experts on the American presidency review the only three impeachment cases from history–against Andrew Johnson, Richard Nixon, and Bill Clinton–and explore its power and meaning for today. Impeachment is rare, and for good reason. Designed to check tyrants or defend the nation from a commander-in-chief who refuses to do so, the process of impeachment outlined in the Constitution is what Thomas Jefferson called “the most formidable weapon for the purpose of a dominant faction that was ever contrived.” It nullifies the will of voters, the basic foundation of legitimacy for all representative democracies. Only three times has a president’s conduct led to such political disarray as to warrant his potential removal from office, transforming a political crisis into a constitutional one. None has yet succeeded. Andrew Johnson was impeached in 1868 for failing to kowtow to congressional leaders–and in a large sense, for failing to be Abraham Lincoln–yet survived his Senate trial. Richard Nixon resigned in July of 1974 after the House Judiciary Committee approved three articles of impeachment for lying, obstructing justice, and employing his executive power for personal and political gain. Bill Clinton had an affair with a White House intern, but in 1999 faced trial in the Senate less for that prurient act than for lying under oath about it. 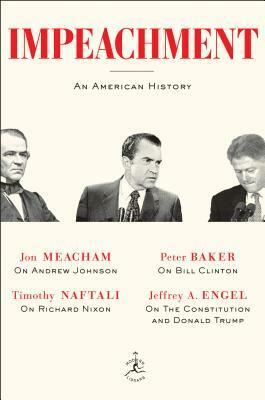 In the first book to consider these three presidents alone, and the one thing they have in common, Jeffrey Engel, Jon Meacham, Timothy Naftali, and Peter Baker explain that the basis and process of impeachment is more political than it is a legal verdict. The Constitution states that the president, “shall be removed from Office on Impeachment for, and Conviction of, Treason, Bribery, or other high Crimes and Misdemeanors,” leaving room for historical precedent and the temperament of the time to weigh heavily on each case. These three cases highlight factors beyond the president’s behavior that impact the likelihood and outcome of an impeachment: the president’s relationship with Congress, the power and resilience of the office itself, and the polarization of the moment. This is a realist, rather than hypothetical, view of impeachment that looks to history for clues about its future–with one obvious candidate in mind. I might have a minor in American history, but that doesn’t mean I knew much at all about the process and history of impeachment in the United States. Of the three presidents discussed in this book, I knew the most about Nixon, because living within thirty minutes of the Nixon presidential library means I’ve been there like six times on various school field trips (side note: if you’re in southern California, it’s worth going once, but the Reagan library is so much better). I vaguely remember Clinton’s impeachment – I was nine – and I knew a little bit about Andrew Johnson because about a year ago, I looked up which presidents had gotten impeached for… reasons. But this book goes much more in depth, and I learned a lot. I enjoyed the history portion of this book quite a bit. I’ve read a fair number of history books, and one thing that always stands out is how they’re organized. The authors did a really great job with this one! It was clear and I liked the four distinct sections. It made sense, but also felt like a cohesive book. I also really liked that it was not overly long. If you’ve ever seen a history book, chances are it’s pretty massive. Impeachment gives a lot of information in just 160 pages, which I loved. It was comprehensive, but not intimidatingly so. I think that makes it more accessible, which makes me happy, because this is a topic I think a lot of people will want to learn more about. And I think the authors anticipated that, because they also talk about why impeachment is relevant now. It’s only happened three times with the presidency of the United States, but it’s an important tool to use when we have, say, a president who is a pathological liar and actively works against the interests of Americans who are not wealthy. I don’t think it’s a secret that I loathe the Commander of Cheese (look it up if you haven’t heard that one), so I did appreciate the continuous shade this book throws at him. He is named within the first few pages, which makes it pretty clear what the aim of this book is. Whether or not impeachment is a good solution to the insanity we’re currently subjected to in the news everyday is definitely debatable. There are pros and cons, and this book does a good job showing both sides. While I think the authors clearly have an opinion, they also allow the reader to decide for themselves in a much more informed manner. Both the history and the discussion of current political events went really well together. I strongly believe that everyone should have their own opinions, so long as they make an effort to come up with educated opinions (for the record, any sort of discrimination never, ever falls into that category – unless you’re discriminating against Nazis, because please do). Whatever your political beliefs, that should be totally up to you. And I think books like this are an immensely valuable resource for people who want to educate themselves, which, in a perfect would, everyone would. Political debates are far more fun if everyone knows what they’re talking about. Just saying. Impeachment: An American History will be available soon (Goodreads still says October 2, but Amazon says October 16 now). Regardless of the actual release date, you can preorder Impeachment on Amazon now! To get the audiobook for free, use this link to sign up for a free trial of Audible and choose Impeachment: An American History as one of your two free books.